World building contest - War Upon the Sands! apart from weird intros, what is going on here is exactly what the title says. the plane: Carcho, world of deserts. 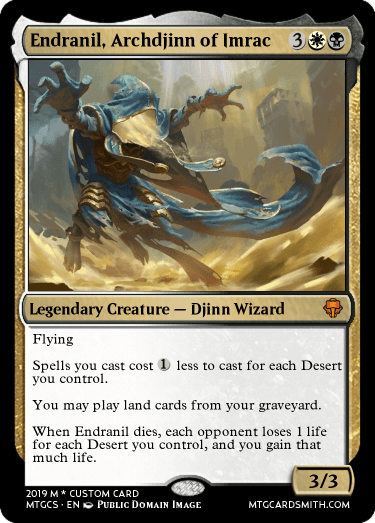 It is a plane that is basically 2 huge deserts, one home to the Krashta tribe, and the other home to the State of Imrac. Tribes: R/G/U. they use elemental magic and animate lands. Compare to gruul clans. create three cards each. That's it. They can be any faction, or non-factioned cards. 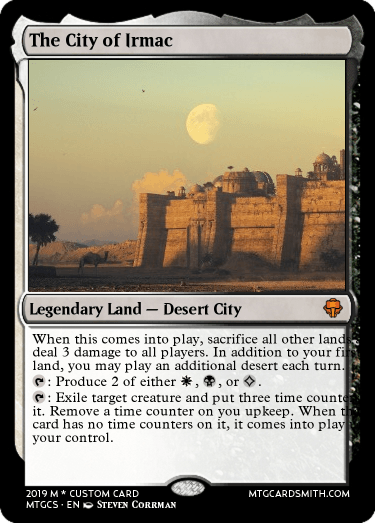 (If you make a tri-coloured land for a faction, make it a desert please). 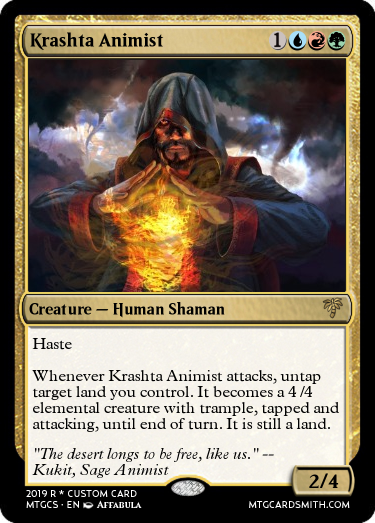 Gor is the shaman of a small Krashta tribe. this tribe consists solely of Agashi (singular Agash), a race of tiger-like, nearly hairless humanoids. one day, he saw some Irmac troops mining his precious mountains for oil and metal. flying into a mindless rage, he attacked the men, and as he finished, feeling the satisfaction of a job well done, his spark ignited. -Brilliants. these are the dragons of Carcho. Predominantly white, they are often enslaved by the Imrac. -goblins. these are much the same as those from other worlds, appart from there reptilian nature. They serve as messengers and scouts for the Tribes. 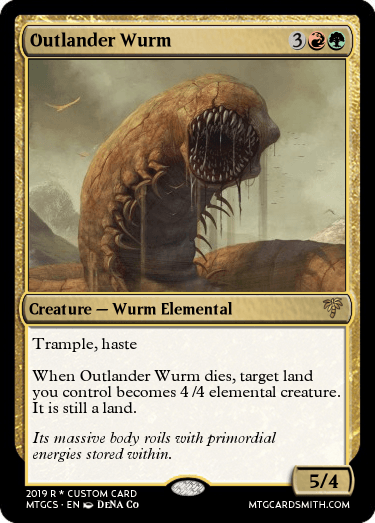 -Wurms. these huge serpents are often domesticated by either faction. -ellocants. a species of beasts, this is in fact the general name for many different species of quadrupedal, mammal-like reptiles. 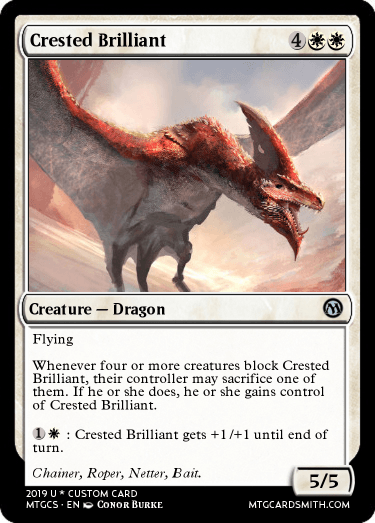 Here's for the first card around, a neutral Brilliant. @KorandAngels I know that Gor's only an example but the emblem's really underpowered. 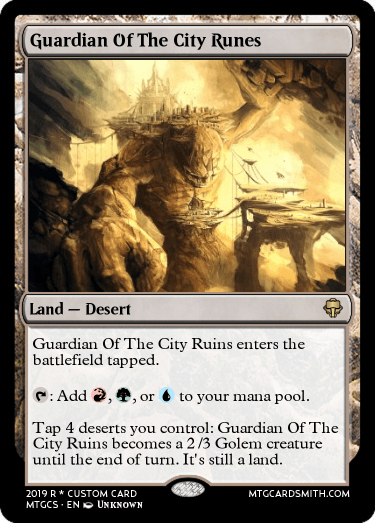 There's an enchantment that does the same thing in white for three mana and it's from the original Zendikar set, which had ways to animate lands at common and man-lands at rare. Admittedly it also affects their lands, but that doesn't matter if they aren't playing a lands deck. Well, I dug out an old concept and made a few new ones, so here are some cards. Not sure why I went for red on all three, but oh well. 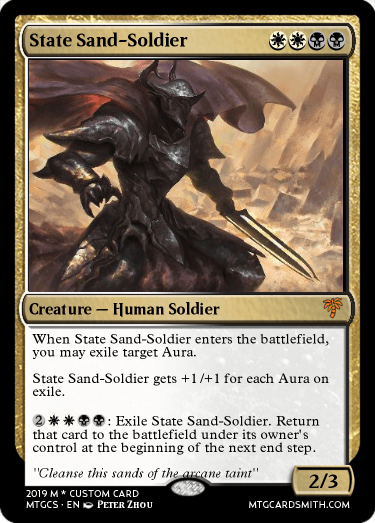 @MemoryHead the text for encircling ellocants should say "When Encircling Ellocants enters the battlefield, create a token that's a copy of it except it doesn't have this ability". @KorandAngels I see what you mean and where you're coming from with that, but no, it wouldn't be worded like that. That would only be done if the token was incredibly complex, which it isn't (and even then you stay away from "without this ability" whenever possible). 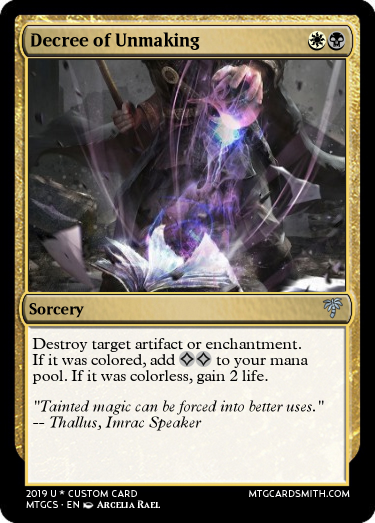 I spent a little while searching for a card that made a token that was a perfect copy of itself without an ability and couldn't, but the fact that that wording has never been used on a real MTG card's oracle text according to Gatherer is probably enough. @MemoryHead Ok. it does work, after all. @korandangels Do my submissions fit? Would you like to see them tweaked? I just noticed a typo. I’ll fix! @korandangels Inwill try my hand at them next, I am more of a leftist underdog kind of guy but I will be able to channel the other. I like that they have colorless and want to implement it uniquely, as somehow part of their culture. 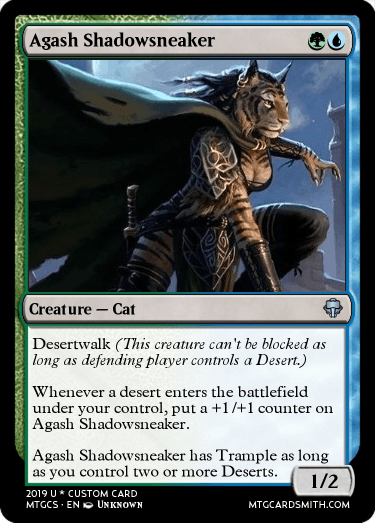 Maybe holding deserts sacred and using desert mana in a very specific way. instead of submitting cards, can I submit a set symbol? @EnvyReaper yes. I don't have premium so I can't use it though. @EnvyReaper can you design one anyway? I don't have any idea what it would be. 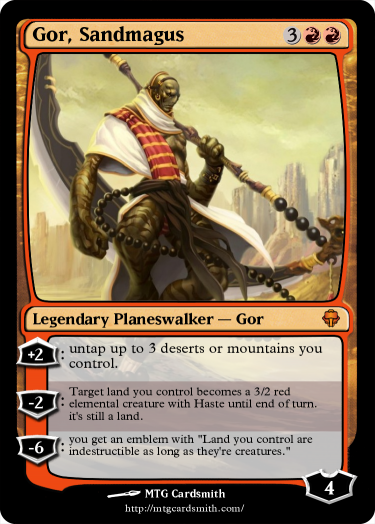 From 1-10 how much would you rate the Khans of Tarkir symbol on basis of looks? @armisjoe Can Agash be a Cat Rogue? 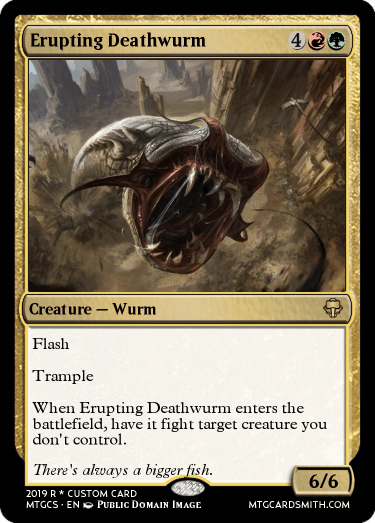 It's stupid in early turns (if you play it on an early turn you practically win automatically because the downside is irrelevant, it taps for two mana, it lets you play an extra land and it has "Tap: Exile target creature but even better). Actually, I pretty much got everything in that single bracket. @MemoryHead. I'll work on it. 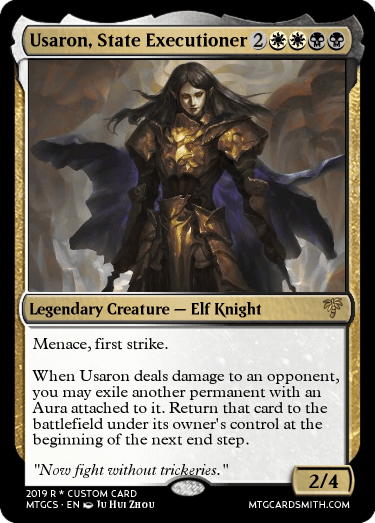 Life Lesson: Don't make magic cards while tired. Do you have any specific wording issues, I can fix those pretty easily. 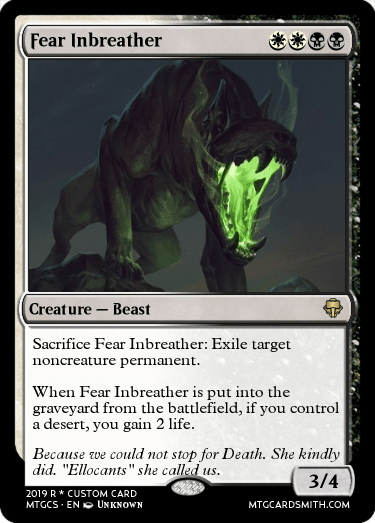 I'm making it cost mana to play, send the creature to the graveyard instead of into play when time counters are removed, and doens't untap during your untap step, pay 4 to untap. 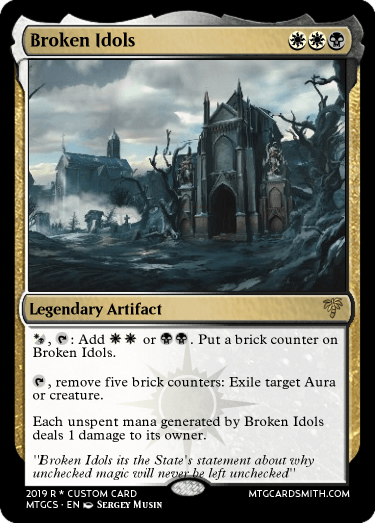 @Netherin5 If it costs mana it'll need to be something other than a land, probably an artifact (and since it won't be a land and will have an untap cost then don't give it a mana ability). Making it send them to the graveyard with the time counters thing doesn't make sense - either exile them or destroy them. The doesn't untap thing seems like a good idea. I can't really fix the wording on a new version until I see it, so I'll leave that be.